Lavender is an all-time favorite because it is relatively inexpensive and you can use it for a range of issues. You can use lavender to help heal cuts, scrapes or even scars that you might acquire in summer activities. It can also be used to relieve stress, help you sleep, help dry skin or itchy skin from insect bites, and a pain reliever. Peppermint oil is great for allergies, sinus problems, reducing fevers, nausea, bloating, stomach aches, it cools your skin, it eases itching from mosquito bites and even repels bugs in the first place. Loved by hippies everywhere, patchouli is great for skin care. It can help dry and cracked skin or even skin that has been irritated by sweat. It has also been said to enhance libido. Sandalwood is great for your skin and can be used to reduce puffiness and even soothe sunburned skin. When inhaled or diffused in the air, it can help you relax. Cypress can be used as an all over body oil because it is great for digestive issues, bloating, chronic congestion or those who sweat too easily. It tends to feel cooling, which is great for summer too! Lemon is a great oil to add to water to help you detox and flush your liver in the morning. It also has antioxidants, is an antiseptic and an antidepressant. This is a great oil for natural cleaning products too. Grapefruit oil can help with a sore throat, treat topical wounds and even metabolize fats. Grapefruit oil has been said to reduce cravings and avoid over-eating if used before meals too. Any other citrus oils. Not only do they smell great, but they can promote a great mood and more energy. Just be careful with all citrus oils and sun exposure. German Chamomile. German Chamomile is great for those sneaky summer allergies. It is also good for relaxation and an anti-inflammatory. Geranium is good for flying to help you after you’ve been sitting too long. It can also help remove cellulite and dry skin and release toxins. 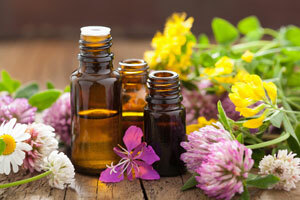 Bonus oils that smell amazing to add to DIY skin care products: Ylang-Ylang, Rose, Neroli, Jasmine, and Helichrysum. Remember to use a high-grade brand like Doterra or Young Living if you plan on applying them topically and especially if you ingest any oils in supplements or capsules. Do you use essential oils? Do you switch up which ones you use based on the season? Which brand is your favorite? Share with us!